......of the existing Winter Garden. The Hydro commissioned Graven Images, a Glasgow based company, to create an interior to blend with the architectural design. A fireplace, a mix of seating, an array of lighting and colourful soft furnishings were introduced to add to the feeling of this being a welcoming yet functional reception area for guests. External areas were treated carefully - to remove the clutter of cars and surface treatments were employed to create a safer "pedestrian zone" around the main entrance to the hotel. 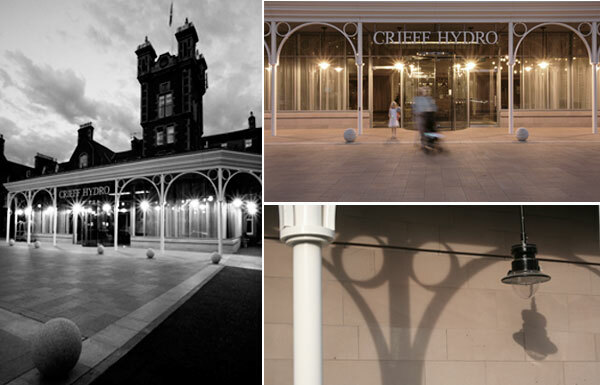 Describing the new entrance in his most recent edition of SCOTLAND THE BEST, Peter Irvine writes - "Crieff Hydro: a national institution and still a family business. I hadn't visited for a couple of years but when I did in the summer of 2011 and saw their most recent improvements, especially the new foyer and reception, I realised that more than ever this is a truly great family hotel, moving with the times...."